The Visitor is an Italian and American co-production from 1979 directed by 8 1/2 actor Giulio Paradisi, credited as Michael J. Paradise. Paradisi’s other small directorial credits include the unfortunately titled Italian film Spaghetti House, supposedly a drama/comedy based on a real 70’s restaurant heist turned multi-day long siege. Legend speaks of an evil force called Sateen, who once terrorized the galaxy until he/it was defeated by the powers of three disciples of Yahveh and various birds while escaping to Earth. Sateen lives on though through the off-spring he/it fathered/manifested in various women. Untold years have passed, and a secret religious sect has started up to find and maintain the modern child of Sateen. An old man, think Old Ben from those early parts of Star Wars episode 4 but in a fishing cap, named Jerzy uses mysterious space powers and tons of blue-screen backgrounds to learn that the next child of Sateen is Katy Collins from Georgia. Jerzy’s mission now is to successfully kidnap and remove Sateen’s influence from Katy; all while the lonely Katy persistently eggs her mother Barbara for a baby sibling. Is Katy’s need for a new relative simply her genetic connection to Sateen pushing her to create more spawns or is it something less menacing, like wanting someone else to play with her in late 70’s Pong? Thankfully, Katy’s not the only person rooting for Barbara to conceive more secret offspring of Sateen, as Barbara’s boyfriend Raymond Armstead is working with an evil cabal centered on raising more children of Sateen…for no given reason but assumed for evil purposes. 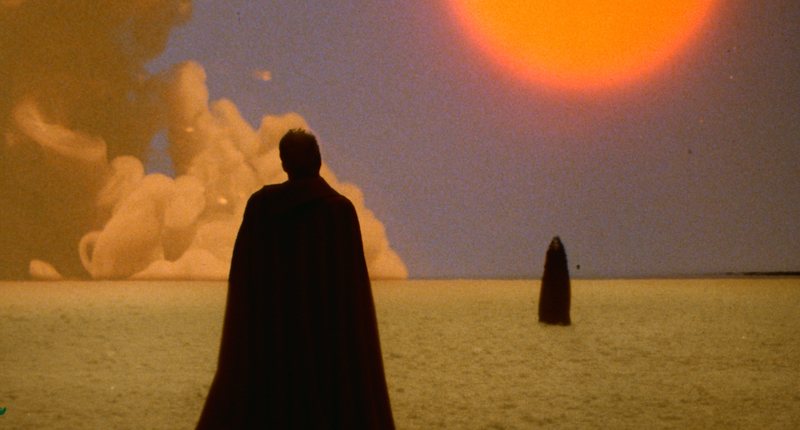 I’ve always discouraged evaluating film based on my expectations, but I was rarely bewildered by The Visitor’s parades of bizzaro melding of 60’s and 70’s horror and science fiction tropes. 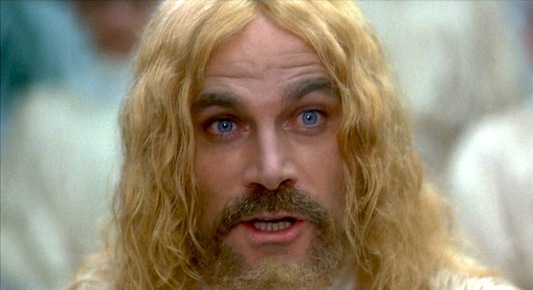 Mixing alien conception with offspring like Katy, with seldom seen telekinetic powers, The Visitor tries to manage these commonalities under its sudo-Christian origin story. 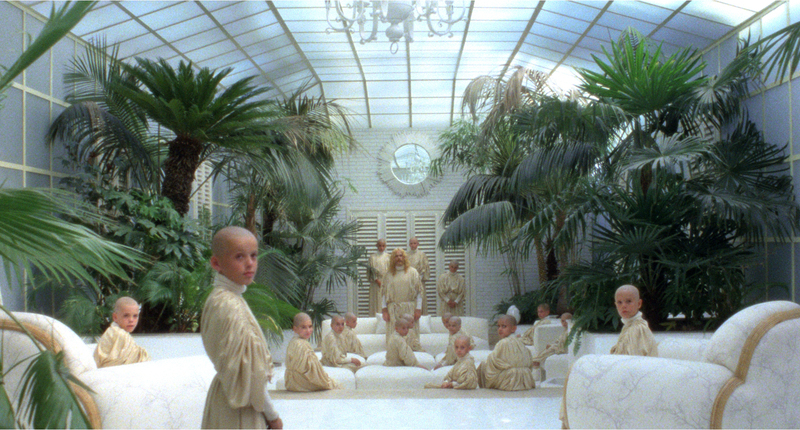 Shots of Jerzy’s random space light shows; visions of a young Katy covered in snow traversing a barren plan; and an iconic scene of a blonde leader educating a room of bald children about the terrors of Sateen as they sit in nice soft chairs, only bookend the film. The Visitor does a nice job of hinting that Katy’s case is only one of many missions of peace that Jerzy has performed, but all the slow milling around in the middle made me forget the bigger galactic threat remained present. 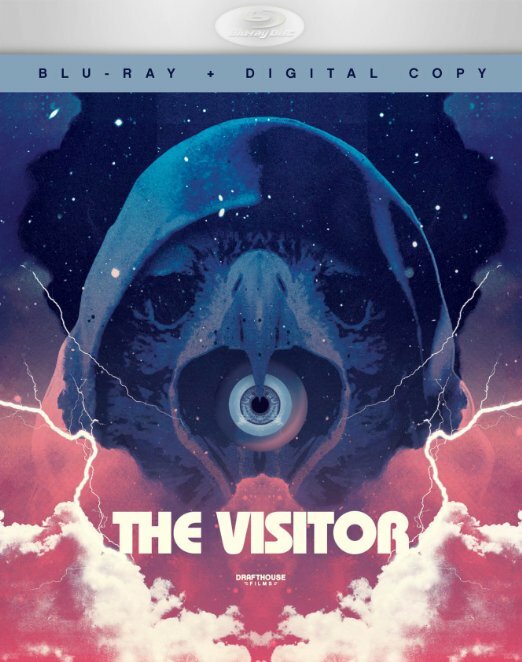 Hell, the various posters for The Visitor, ranging from a hooded hawk with an eye in its mouth to a single eye hovering over a city scape holding bloodied chicken wire, were more fanciful and different from anything I witnessed in The Visitor. Maybe I’m just jaded, eyes awash by too many Alejandro Jodorowsky films, but the craziest thing I can recount of The Visitor was not a house filled with flocks of birds, but Katy’s odd logic leap of chastising her not-perfect gymnastic skills in what felt like mere hours after she accidently shot her mother in the back with a handgun at a birthday party. Now most of the adults in The Visitor aren’t that engaging, with Raymond getting screws drilled into him by his superiors, fully treating marrying Barbara as a second job. Barbara isn’t allowed to work with much, as she is completely at the mercy of everyone around her. Katy and Jerzy thought are actually interesting characters. Katy’s portrayal flips back in forth between a normal eight year old and the expected Damien from The Omen just as frequently as her come and go Southern accent. What’s nice is that instead of just keeping her around to just glare and “accidentally” murder people who piss her off or blow up a basketball before a NBA player makes the game’s winning basket (no joke, they designated what felt like ten minutes to this part), Katy just gets to be this snarky kid who is just oddly competitive at sports. Jerzy’s got a been-there-done-that old man vibe, but even he’s often relegated to bid time atop building with his disciples and in malls, his kind nature make him endearing. When Katy and Jerzy finally interact, when Jerzy babysits Katy under the cover that he works for this unnamed agency that also provided the Collin’s new house keeper, it’s sort of sweet. As expected, they don’t resonate near as well as Jesús Gris and his granddaughter Aurora from Cronos, but one of the best scenes in The Visitor is when they are playing Pong and Jerzy accuses Katy of using her powers to cheat, both actively discussing that she is a telekinetic child of Sateen like it was as important as if they wanted to order Pizza Hut for dinner or not. Pros: Some of the character interaction between Katy and Jerzy is un-expectantly pleasant. Nice Georgia cinematography, with a few distinctly good camera shots. Sixty percent of the film takes place in the Collins’ awesome 70’s home, with its spiral stair cases, interior decorations like a Buddha statue and an arcade cabinet, and finally a big pool randomly located in the middle of the house. Cons: While never truly boring, The Visitor tends to spin it’s wheels on uninteresting segments like dragging out the basketball game longer then it needed to be. Plenty of time is invested with Jerzy waiting to act atop of building with his fellow older disciples, but the film builds them up and never does anything with them. The space galaxy religion segments only bookend the film, almost like I was tricked out of a weirder viewing experience. The distinct theme song is loudly played over even the otherwise quiet scenes which seems abusive and annoying. Not surprising for me, The Visitor is another Drafthouse Films release. The Visitor’s hard to recommend not because of any concern that it might weird out a normal film viewer, but because I know my usual readers would just be underwhelmed by what The Visitor has to offer. If you noticed, I purposely filled this review with screen shots centered on The Visitor’s spare instances of unworldly visuals, but in the end, it’s just a film about a vexing Georgian youth who just wants someone to play Pong with and a maybe alien old man whose job is never done. Take it or leave it.